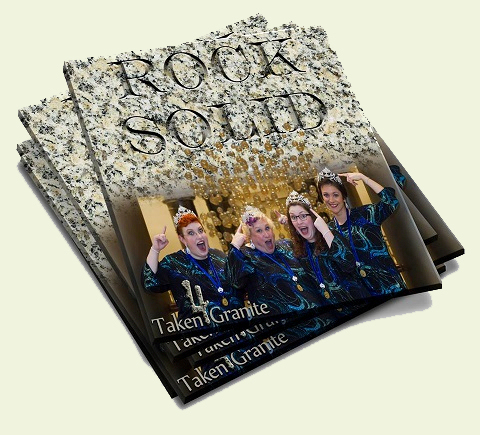 After singing together for almost four years and winning the Harmony, Inc. International Quartet Championship in 2016, Taken 4 Granite is excited to announce the release of our first album, Rock Solid. It captures our best-known and loved original arrangements, from "Taylor the Latte Boy" to "It Don’t Mean a Thing," some classics like "Some Enchanted Evening," and new favorites like our "Sutton Foster Montage" and "Titanium." Rock Solid is available now for online purchase! Click here if you would like to order a CD or an official T4G t-shirt. We would like to thank all of our backers for helping fund this effort -- we could not have done this without you! And a special shout out to our Boulder Level backer, the Downeasters Chorus!